Gerrard, a popular name in Maryland Clary families, was spelled various ways in early records: Gerard, Gerrard, Geriard, Jarrad, Jarrot, Garrot, Jerrat. GERRARD CLARY, son of Benjamin, was the first of that name in the Maryland Clary clan. There were families with the surname Gerrard in Anne Arundel County, Maryland, in the early 1700’s. An association with them may explain Gerrard Clary’s name; perhaps his mother was a Gerrard. Gerrard inherited through his father’s will the home plantation in Frederick County, Maryland, after his mother’s lifetime. By 1800 Gerrard was living in Allegany County; the census (spelling his name Garrot) list with him a woman over 45, probably his widowed mother Eleanor. Three slaves were also shown. In the little town of Clarysville, in Allegany County, stands an old inn, reportedly built in 1811 by Gerrard Clary. Known for years as the Eight Mile House (eight miles west of Cumberland) it was well located on the main route of travel from Baltimore to Wheeling. It was one of many taverns, stage houses, and wagon stands located along this route, which was even more widely used after it became the National Road. The National Road, built of crushed stone and opened in 1818, was in its day the most ambitious road-building project ever undertaken in the United States. It became a major highway for western migration. Today’s U.S. 40 closely follows the original route. After Gerrard Clary’s death, the Eight Mile House was operated by his nephew, Aden Clary. During the Civil War, this inn at Clarysville played an important role as a convalescent center for Union forces. Its convenient location, and its healthful setting, made it ideal for the purpose. Bread for the hospital was baked in Cumberland and sent along the National Road to Clarysville. A description and picture of the hospital are included in Allegany County, a History. In the 1850 census of Allegany County, taken shortly before Gerrard’s Clary’s death, he was listed as an innkeeper, age 74. Besides his wife Rebecca, 66, the household included daughter Rebecca Vrooman, 32, and granddaughter Lenora Vrooman, age 9. His will, written 31 July 1846, four years before he died, is included in our Appendix. It emphatically and repeatedly excluded his son Nelson from any part of the estate, but cancelled all debts owed to him by Nelson. Item, It is my desire that my Servants should be kept in the Family & at my Wifes [sic] death, to be hired out & the proceeds equally divided among my Children except my son Nelson Clary, who is to have no lot or part in my Estate. 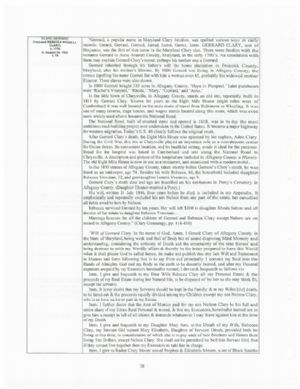 Item, I further desire that the Amt of Monies paid for my son Nelson Clary be his full and entire share of my Estate Real Personal & mixed, & that my Executors, hereinafter named are to give him a receipt in full of all claims & demands whatsoever I may have against him at the time of my Death. Item, I give and bequeath to my Daughter Mary Ann, at the Death of my Wife, Rebecca Clary, my Servant Girl named Mary Elizabeth, Daughter of Servant Dinah, provided both be living at that time, in consideration of which she is to pay each of her Brothers and Sisters then living Ten Dollars, except Nelson Clary. She shall not be permitted to Sell this Servant Girl, but if they cannot live together then my Executors to take her in charge.